A Beautiful Holiday Season To You All! Muse Frodo has made the slightest intimations that he might be back to help me out of my "I can't go on!" hole regarding Threshold. I am so relieved! I actually feel like getting on with it, although the holidays and travelling will slow me down quite a bit. Here's Frodo now, reluctantly leaving the Shire behind just to come visit me in Minnesota. He doesn't look any too happy about it, does he? Not only was Rudbeckia Goodbody about to offer him a choice spot right beside her before the fire, the colour of her dress set his eyes off nicely, too. Frodo is a wonderful hobbit for making personal sacrifices, though. I am so grateful. I love that!! He certainly doesn't look to keen, though. Very best wishes for Xmas and the New Year to you too, Mechtild. Here's to more Fro-perving in 2006!!!! No, he doesn't look keen at all. Hopefully, once he's been back here for a while, he'll feel like staying again. How I have missed him! 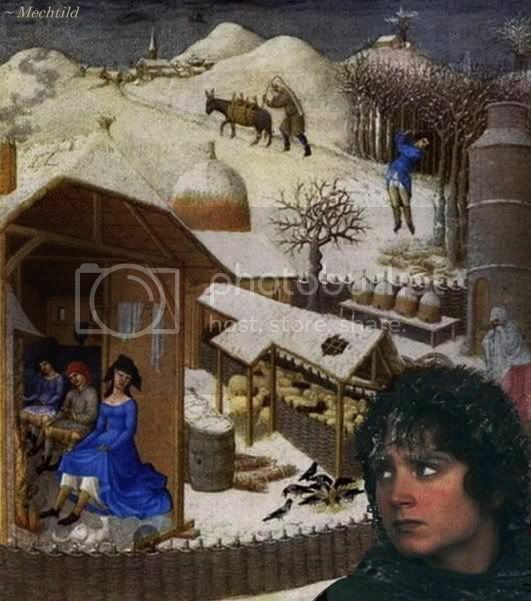 Could you give Frodo directions to come down through Michigan on his way home after the holidays? I could meet him at the bridge with a cup of hot chocolate to warm him up. Thank you! Merry Christmas, Mechtild. I've enjoyed your screencaps immensely, please continue. See you around LJ and KD in 2006. Oh, I think he can manage to stop by, Shelbyshire. Michigan is right on the way to Minnesota (from the Shire, that is). Furthermore, I am sure you will be able to warm him up with more than a cup of hot chocolate. ;) Throw that eiderdown off the bed. You won't be needing it. Nope, it's not going on our Christmas card. The ghosts of the Limbourg brothers would come back to haunt me, too. A peaceful and blessed Christmas to you, dear! Thank you, Belegcuthalion. I hope your holiday wine is suitably warm and spicy. I cannot blame him for looking glum. No one wants to turn up his collar to the cold and damp when he could stay beside a fire. Especially when it's got its dress hiked up. Merry Christmas to you and your family, Mechtild! I'm sure you'll make Muse Frodo feel MOST welcome, and he won't need to go out into the cold and damp at all! Of course he will. This is Minnesota! He will have to go out and fetch the firewood, at least. Besides, going out in the cold will make him all the more appreciative of the warmth inside.